As a location photographer in New York City, I always have my eyes peeled for good subjects; Lord knows there is an endless number of great possibilities for images. This shot was what I call a "no-brainer". How can you resist a shot of Big Bird in Central Park? You know it's Spring when the birds return to Central Park. 185mm, f4 at 1/250th sec. I'm no Gene Kelly, singing and dancing in the rain, but I do like shooting in the rain. The world looks different when wet and with a little awareness and creativity, the inclement weather can provide outstanding photo possibilities. I like how light reflects off of wet surfaces and often shoot in ways to use color and light to enhance a scene. Sure, you have to be careful with your gear when it's raining and be particularly aware of raindrops on your lens, but simple precautions and a clean, dry cloth are all you need unless it's a downpour. Like the cold weather I talked about last month, most people don't like to go out in the rain; if you get out there and explore you'll be ahead of the game from the get go! The Waverly Diner is a classic New York City diner and has colorful neon signs that reflect beautifully on the wet pavement. ISO 1000, 1/30 sec. f2.8, 28mm lens. The Boy Scout motto serves photographers well. By always having a camera with you and always being ready to shoot whatever strikes your fancy, you will inevitably capture some gems. I was walking down lower Broadway when I saw these tourists "holding up" the Red Cube, a sculpture created in 1968 by artist Isamu Noguchi. It's a fun picture and it was gone in a moment. The best camera is the one that is with you, just be prepared to use it. The "Red Cube" is located on the plaza at 140 Broadway. ISO 400, 1/60th sec. at f5.6, 20mm lens. Grand Central Terminal is one of the most beautiful building in New York, steeped in history and bustling with activity, it's a source of never-ending images. From the grand beauty of the main concourse to the old fashioned details of the ticket booths, from the priceless clocks to the harried commuters, Grand Central is a photographers dream. taken with a fisheye lens on my phone. Thirty five years ago I was poking around the terminal and somehow found myself up in the catwalk of the big window on the west end of the concourse; I found that the windows were hinged and I could swing certain panes open and take pictures. It was dark in the terminal back then because the big Kodak Colorama mural covered the east windows (those panorama images were 18x60 feet). Unfortunately, I can't seem to find those negatives and in today's post 9/11 world, there is little chance to get back up on the catwalk. Luckily, there is plenty to shoot at ground level! Commuter rushing to catch his train. 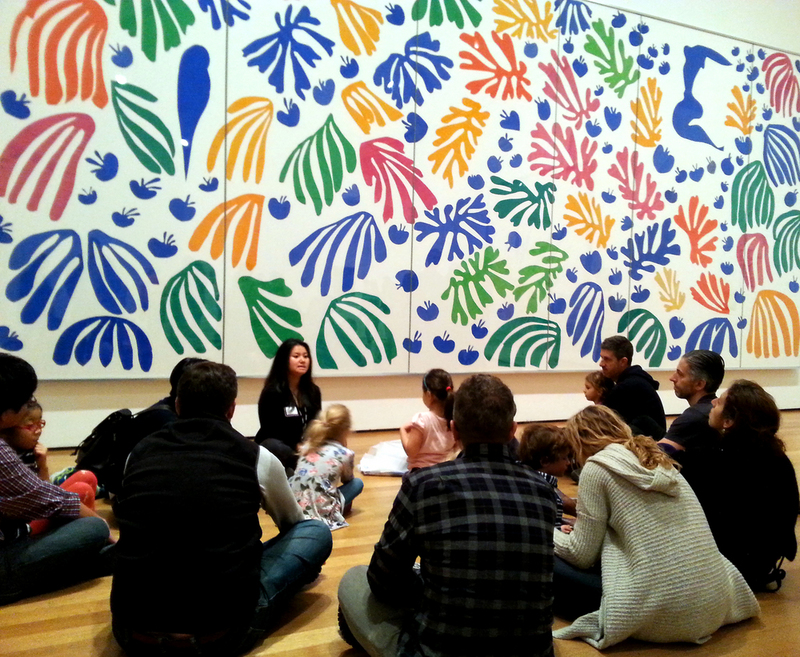 The Matisse "Cut Outs" exhibit currently at the MOMA in New York is a beautiful and inspirational show, but the biggest thrill I had while there today was seeing the parents & kids art classes in a couple of the rooms of this major exhibition. What a gift these thoughtful parents are giving their children by enrolling them in a class that lets them explore their creative side. The participants hear about the work and then sketch their own drawings on pads of paper. I could only smile and wish that I was exposed to such great art when I was a child. Luckily, I took an interest in art early enough in life to still be thrilled by the beauty that can be produce out of sheer creativity. Who knows, there may be a future Matisse sitting cross-legged in this crowd. Photo taken with my phone as the guard told me, "no pictures". LOL. I was headed home, walking down 8th Avenue at 39th Street when I noticed the light changing. It's hard to see the horizon in New York City, but at the next cross street I could see to New Jersey and see that the sunset might be nice. I was late for getting home but I just knew something good was about to happen; the problem was, in that part of the city there really isn't much to shoot. Forgetting that I told my wife I'd be home in ten minutes, I cut west on 39th Street looking for possibilities. At 10th Avenue I saw my subject: the high rise luxury condos that have sprung up along far west 42nd Street, they would make a good foreground to the intensifying sunset. It was a race against a quickly setting sun, but I finally found my angle in the middle of the entrance to the Lincoln Tunnel; I literally had to shoot between all the buses heading into the tunnel at rush hour. Once you find the right angle and time the sunset perfectly, it doesn't take long to get the shot; I was done before the cops rousted me. As an added bonus, I noticed this plane heading south out of LaGuardia and waited for it to be in the right spot; to my eye it's the added point of interest that makes the photo even better. Pardon the alliteration, sometimes I can't resist! But there's an important point behind my silly sense of humor. The more details you have worked out in advance, the better your images will be, especially when photographing people. It starts with "seeing" your image in advance and experimenting with the angles and composition even before your subjects are in front of the camera. Once you have your shot set, nail down your exposure and, if possible, do some test shots with stand-in subjects. By being properly prepared, you can concentrate on directing your subject and shoot quick variations without wasting valuable time. These police officers in Times Square were kind enough to pose for me but obviously had little time or patience for a "photo shoot". By being prepared and knowing exactly what I wanted, I was able to shoot 12 images in 21 seconds (I checked the metadata time stamps) and used the time to direct them where to look and how to position their arms. Shot at ISO 400, 1/60 sec. at f7.1, 16mm lens.